They have a long lunch time in their house with their family. A Spanish husband said “if I just come back to my house for sleeping, my house is like a small hotel (pension). I think if Spanish women get married Japanese men, they might divorce soon!! Now it is 23:40 Pm. But my husband can’t come back to our house. I think you can’t imagine our situation. I have to say for his honor. He is a very nice husband and father for our family. So he can’t do like Spanish. There's something I want to say here. I wish I live in Spain. Gagaku is a type of Japanese classical music. Bugaku is Japanese classical dance. Though Japanese, we do not have chance to listen to much such music now. My younger son likes Japanese idol on TV. I heard this party was kids who danced front of the pond. We are apt to oversleep in spring!! I thought I just slept with my younger son. But, when I woke up, it was next morning!!. I feel very nice with sons in the futon, they are very warm and they have nice smell. By the way these trees are Japanese apricots called Ume in Japanese. It is very warm in Japan this winter. It is early this year that Japanese apricots bloom. There are several Japanese trees in Japan. I think blossoms of dark pink is more beatiful than white. It is the best Japanse aprocot in Ojisan's house in Nara. This Japanese apricot is in my mother's house in Kawasaki. In 1972, the Winter Olympic was opened in Japan of Sapporo city. When I was young, a lot of toilets were Japanese style. Also passenger train toilets were Japanese style in Japan. Therefore a girl thought Alpine skiing looked like toilets of shinkansen. If you don't know Japanese style toilet, you might not imagine this story.. When I was in my yonger son age, I didn't know this sports. Do you know Bonsai? 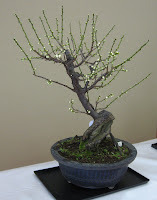 Actually I can’t explain Bonsai. So I check my English Dictionary. A tree that is grown so that it always stays very small, or the art of growing trees in this way. This tree is Japanese apricot. We say “Ume”. When I take a walk near my apartment, I can find “Ume”. Which is advantageous with woman or man? If you can choose them, which do you choose woman or man? I am a two son's mother. And I have a job. Sometimes I have a lot of stress. If I have stress, company pays money for me. But sometimes I can't put up with Japanese school's system. That is PTA. Parents have to do it. But I cant' do that. Japanese schools start form April so, I am depressed on April. In Japan usually fathers are too busy to do PTA's job. I think company's job is easier than PTA's job. Threfore I think it is easy for men to live than a women. My uncle, who sent a picture for me, lives in Nara. Do your countries have pine trees? Pine tree is called “Matsu” in Japanese. 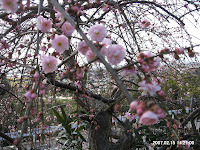 If you go to temples in Japan, it is easy to find “Matus”, which is familiar tree in Japan. Todai-ji is a very famous and historical temple in Japan. Todai-ji is right building in this picture. I think that is a one of Japanese beautiful view. "Oni wa soto! Fuku wa uchi!" If we say it in English, Damons out! Fortune in!! 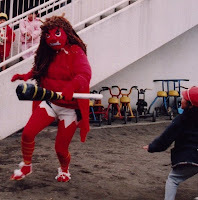 My sons were scared the "red oni" in his preschool . They threw beens, while they were saying "Oni wa soto! Fuku wa uchi!" in a big voice. Some kids were crying..
"blue oni" had come to his preschool. Anyway "oni" was preschool teacher.